As digital marketers, we’re always buried in reports, data, and metrics to review. Sometimes, this information is useful. A lot of the time, the information leaves us scratching our heads wondering if our marketing is working and getting a return on the investment. When we evaluate advertising and marketing (or worse yet – buy advertising and marketing products) without knowing what success or failure will look like, or without knowing what will help us achieve our business goals, it’s like going grocery shopping on an empty stomach with no shopping list. Things are going to get expensive and odds are, you’re going to end up with a lot of junk. Have a seemingly simple discussion with your management team. Why does your website, SEO package, Facebook page, etc. exist? Really think about it. Having discussions about why you have a website and spend money on digital marketing forces you to pull out the business objectives your campaigns are supposed to support. Make sure your objectives aren’t too vague (i.e. sell more cars and make more money) as you won’t be able to develop plans to carry out your objectives. Make sure they’re clear and will help the bottom line. Identifying why your website exists in the first place and creating a few objectives like generating leads, getting more service appointments, and doing a better job with customer retention will start you in the right direction. Your objectives might not be as broad as the examples I listed. Maybe your objective is to increase service retention for customers out of warranty or to increase your PRU in F&I. As long as your objectives real business objectives that will bring value to your dealership and are executable – you’re on the right path. What drives someone to submit a lead, make a phone call, or walk in to your dealership? Maybe…it’s doing a really great job at merchandising your cars, so one of your initiatives could be to write better vehicle descriptions (for great ideas on how to do this see Brian’s post) or to hire a photographer to take better photos. Perhaps…it’s convincing someone they should buy your brand over the competition. Your goal might be to provide robust information on your website as to why the Audi A3 leaves its competition in the dust. Probably…it’s convincing someone why they should buy a car from you or service their car with you rather than the guy down the street. Your goal could be to have compelling information on your website about why someone should do business with you, what they should expect when they walk in the door, and who they’re going to meet. (I’m looking at you – dealerships who have an “About Us” page that says “[Insert Dealership Name] is a new and used car dealer in [Insert City] and our number one goal is customer satisfaction). Whatever your business goals are, develop an action plan that lists what tasks/initiatives you need to carry out to support those goals. List who is going to do them and the timeframe in which they need to be completed. Repeat this process for all of your initiatives that you think will help you hit those objectives you listed. It’s all well and good to write down some objectives and goals, but in order to measure the success or failure of your initiatives, you’re going to need a way to measure your results. The key to doing this? Choosing great key performance indicators (KPI’s), setting targets for your KPI’s, and giving your KPI’s the “So What?” Test. Say a couple of your objectives were to raise more awareness for your dealership and increase your new car sales by 10% this month. Your action plan is to do some additional advertising to get your name (we’ll call you ABC Motors) out there and to photograph your entire new car inventory. So, you decide to run some branding campaigns using banner ads on Cars.com to raise awareness and hire a company to come out and shoot 60+ amazing pictures of all of your new cars. Great KPI for raising awareness? Branded organic traffic (the amount of times someone puts “ABC Motors” in their search query). Set a target of a 10% increase in branded searches. 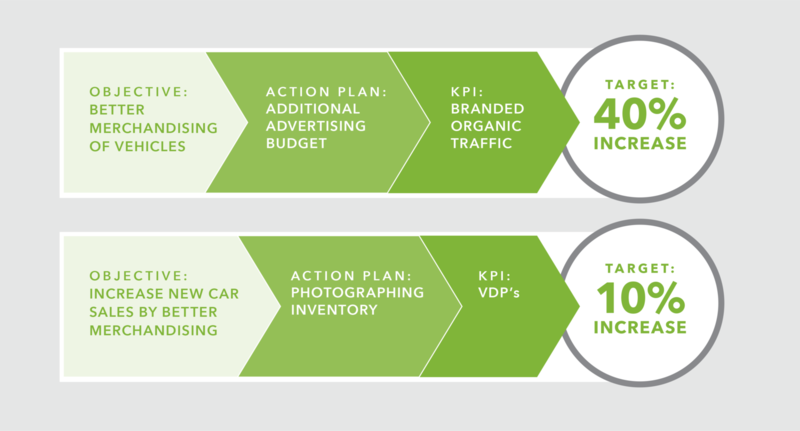 Great KPI for increasing new car sales? New car VDP (vehicle detail page) views. Set a target of 40% increase in VDP views on your website or Cars.com/AutoTrader/BobsCarBarn.com. Even if you have to tweak your targets as you go, just set one. And please make sure you don’t choose wimpy KPI’s. For example: Banner ad impressions. Wimpy. Clicks. Wimpy. Neither of those tell you any kind of story of whether or not you’re going to get more leads or make more sales. Give all of your KPI’s the “So what? Test.” 100,000 banner impressions? So what? Now, if you said that you got 100,000 impressions and 90% of the 100 people that clicked on your ad looked at inventory and they all stayed on your website for 4 minutes on average…that’d be pretty cool. Engagement from the traffic coming from those banner ads or 50% VDP Views would be non-lame KPI’s because you know that people who spend a ton of time on your website and look at a ton of your cars are way more likely to submit a lead and buy a car. Giving all of your KPI’s the “So what? Test” helps you cut through all the fluff and random metrics on that 42 page report on your desk. If you choose great KPI’s you can work through any report/dashboard/analytics platform like a mastermind because you’re focused on finding the meaningful data. Having your business objectives, game plan for tackling them via your digital marketing channels, and properly measuring the success/failure of your efforts makes every meeting with a vendor, agency, your social media team, etc. way more impactful. Everyone will be clear on the expectations, tasks that need to be tackled, and what success will mean in terms of benefit and value to your dealership. Make strategy and measurement the foundation of everything you do in digital marketing and you’ll be guaranteed to find a route to success. For a way more in-depth look at creating a marketing and measurement model – check out Avinash Kaushik’s post on this topic. His framework certainly inspired me to look at marketing strategy/measuring results from an automotive perspective.